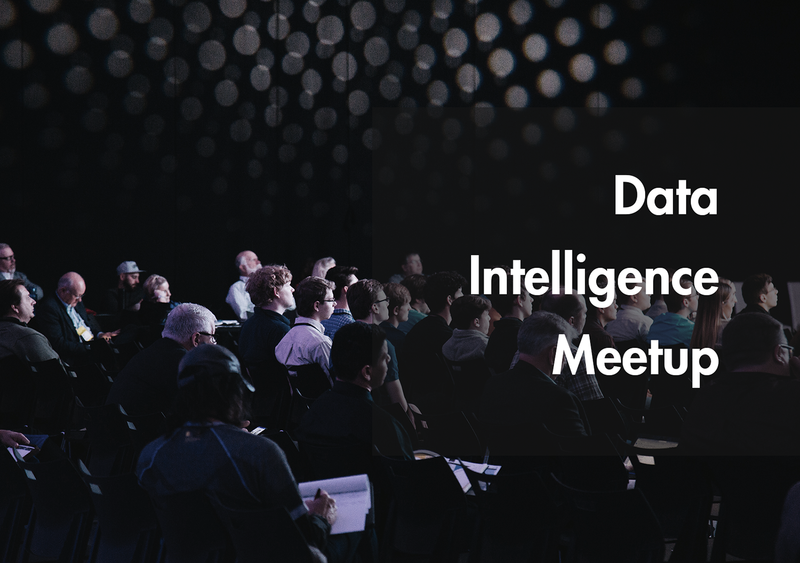 We’re back again with the articles and speaking to AI trends that were touched upon during the AI summit, hosted by Develandoo Innovation Lab in Munich. We’ve written about such topics as the future of AI+humans, how this collaboration can impact our lives, how autonomous environments can make life easier, the idea of sense of touch in robotics, how it’s possible to generate poems through recurrent neural networks, and others. ‘’Conversational AI, Welcome to the Age of Assistants. ”Today we’re going to dive deep into the talk of one of our prominent speakers, Michael Muckel. He is the CTO of Fineway, a travel tech startup based in Munich. He is helping develop the Fineway Conversational AI, a service powered by advanced statistics and machine learning methods to decode your travel DNA. Based on hundreds of accumulated data points, the company successfully creates and delivers truly personalized travel experiences. At Fineway, Michael is responsible for evolving their technology and data strategy, building a scalable and resilient microservice architecture based on cloud services, and deepening the expertise in machine learning and analytics. So before starting his talk and giving more information about Conversational AI, our speaker shared his personal story, his experience graduating from university. At that time he had a chance to visit the IBM Research Laboratories and was introduced to the state of the art technology of those days. ‘’We were talking about variables, location-based services and how voice could control devices. But I was not really thrilled. So I mean they showcased everything, they were all Ph.D. researchers who have done a really incredible job. But the problem was that I was really thinking about a specific kind of telephone. It was 2000 actually, when we were talking about application-based services or voice control systems and it didn’t make sense at that time. So at that time, you had those telephones which were actually not connected to the Web. They had monochrome displays. So that was actually not something that you could envision to happen in the future and we’d interact with the world. But then only seven years later this happened. And this was really a revolutionary breakthrough in how we interface or how we interact with devices’’ told Muckel. He explained that the main point that he wanted to make with this story, is that from his personal perspective and from the perspective of the company he is working for, they’re really experiencing a fundamental shift in how they interact with these devices. So Muckel further told the audience what drives this relational shift is actually related to different kinds of topics: 1. personalization, 2. Intelligent devices, 3. Artificial Intelligence, 4. Voice-based interfaces. ‘’So when you’re building a user-oriented product for you to see customers they actually expect that this is a product mostly they expect it to be free of charge but they wanted to be for them really personalized. So the Netflix you’re using, for instance, should be your Netflix. It’s the same technology but what actually matters is the personalized content. So the next trend, intelligent devices which actually have the ability to sense into the world to be always connected. We have the power to move them to run sophisticated models on the device. And this is actually a major source. And artificial intelligence, that’s why we’re here today. So we have applied machine learning which is just one instance of AI where we can use it today readily to build products. And the last one is actually voice-based interfaces,’’ said Muckel adding that right now we’re in the early stages of voice, and voice is a trend that all big innovative companies like Google and Amazon are betting on. 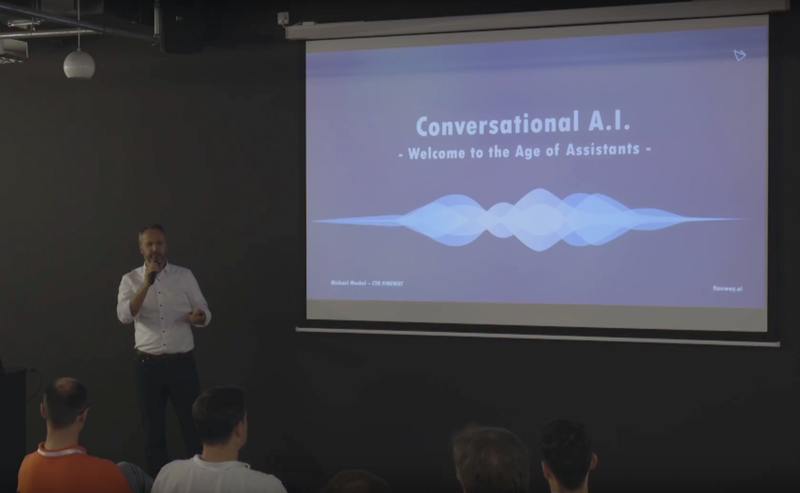 Muckel further spoke about some common practical examples where AI can use conversations, where we can use AI to build a system and that was the actual topic of the talk, AI-based assistants. ADA-personal health companion app where a conversational type of approach is also used for medical diagnosis, where you can start a conversation about your symptoms and it figures out what kind of illness you may have or if you actually need to see a doctor soon. Google duplex–voice assisted calls, also Facebook Project M–personal assistant and others. 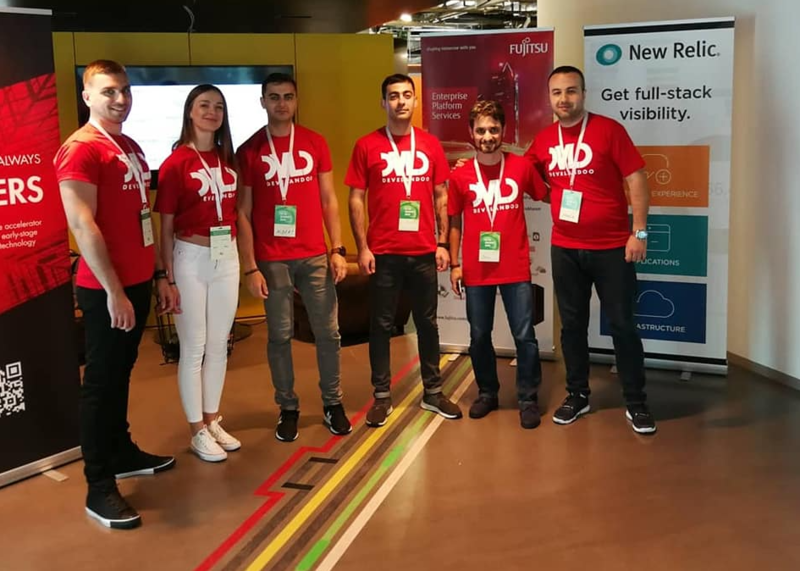 He further explained how and for which purpose these applications are used, also introducing in detail the idea of the startup he is representing. If you liked this topic which has a lot of interesting aspects, check our youtube channel to find the official video of our speaker’s talk.